When was the last time you had a fairy cake? They seem to be the product of school fetes and children’s cooking. Butterfly cakes… now I loved them! I do however remember liking the buttercream more than the cake, and making my own portion of buttercream to eat on it’s own. That makes me feel a little bit ill at the thought of all the butter and sugar I ingested on it’s own. On a cake – fine. From a spoon… hmm. Whilst I’m on the subject of extreme eating, I know of a friend who used to pour cream into a bowl, add sugar and eat it with a spoon. And a friend of a friend eats sugar sandwiches. I suppose these behaviours are in the same category as eating peanut butter or nutella from the jar, yet for some reason this seems more ‘normal’ than taking time to create your own sugar and saturated fat mixture to scoff straight from the bowl. Back to fairy cakes. I think you can buy them in supermarkets, but the individual cake market has been saturated by the cupcake. The American super-sized beast of a cake with more icing (sorry, frosting) than actual cake. Not to be confused with the poisonous mushroom Hebeloma crustuliniforme, fairy cakes are dainty, perfect mouthfuls of sponge cake topped with an amount of icing that is not diabetes-inducing. I was actually wondering if I’d dreamed up water icing, it has become so seldom mentioned in recipes, replaced by it’s big cousin buttercream, and lashings of it. But don’t be fooled by the petite demeanor of the fairy cake – their modest size may well lead to multiple consumption of these treats. Five fairy cakes probably hold as much potential as one cupcake. That’s understated Britishness right there, summed up in edible form in the fairy cake. From time to time I go through a cooking frenzy, where I know I have ingredients, and boy do I want to use them! The butter, eggs, sugar and flour potential in my kitchen led to me wanting to bake something simple – it was here that the fairy cake came in, perfectly fitting the time frame I had, and a fitting gift to bring to my friend’s house a few hours later. Fortunately, I had fairy cake cases – you can’t make do with cupcake or muffin cases, they are simply too big. The baking commenced. 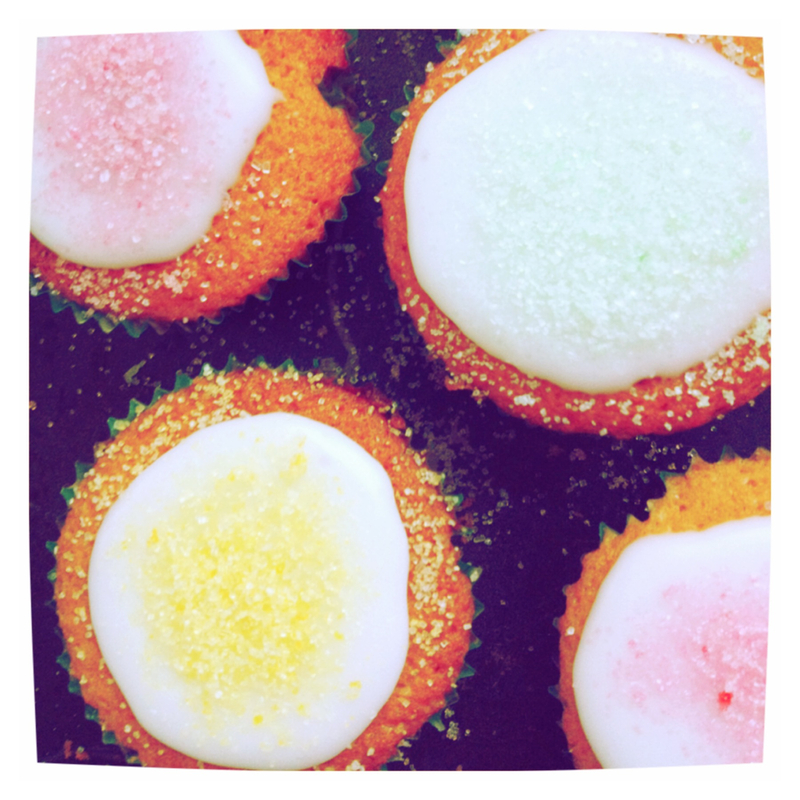 I whipped up my water icing (icing sugar and water) and decorated the cakes with coloured sugar. 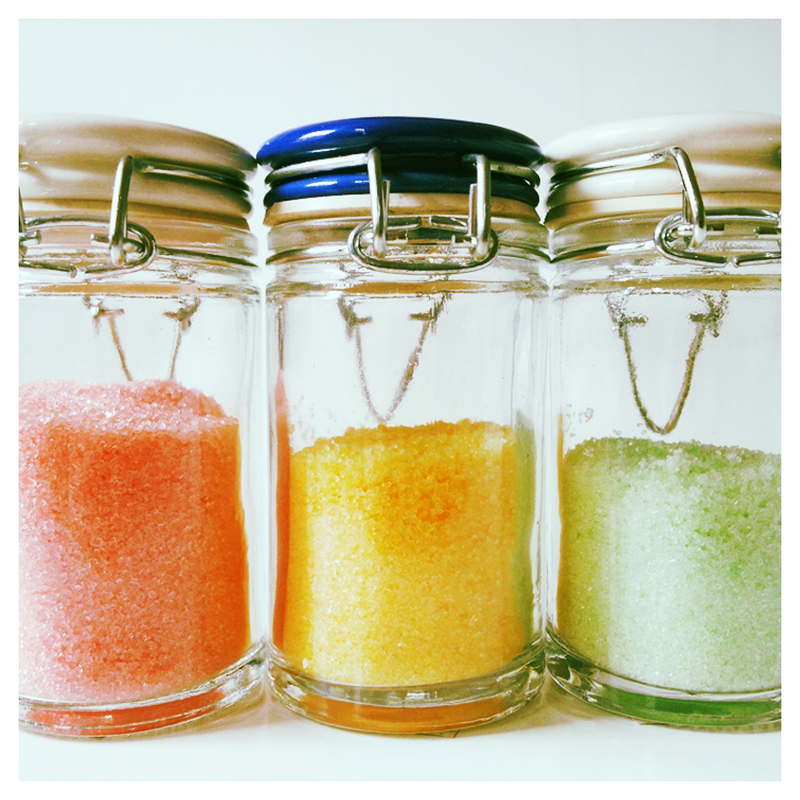 Whilst the cakes were cooking, I made some coloured sugar. The recipe suggested it, and as I didn’t have many other decorations aside from some nuts and desiccated coconut, I thought I’d make some of my own. You can buy it, at around £2 per colour but as I had plenty of sugar and food colours I didn’t need to waste that money. It’s easy. I used about 6 – 7 teaspoons of granulated sugar (you could use caster if you wanted), put it in a mug and then added a really small amount of food colouring. Mix well, so that there are no clumps of colour. I was going for a pastel effect so I also added more sugar afterwards to dilute the shade. Obviously add more liquid if you want brighter colours. I used liquid food colouring, and I heard that it makes the sugar quite wet and you’ll need to leave it to dry. It didn’t make it too wet and it had dried by the time I came to decorate the cakes. The jars were 2 for £1 in Tiger. So there you go, a little hark back to childhood, with a simple baking recipe that looks and tastes great and is perfect with a cup of tea. And I now have a selection of coloured sugar for decorating in the future. Let’s bring the fairy cake back! This entry was posted in Uncategorized and tagged baking, British, butter, butterfly cakes, cake, coloured sugar, cupcake, dainty, decoration, eggs, fairy cake, fairy cake revival, flour, food colouring, frosting, icing, icing sugar, jars, nostalgia, quick, simple, small, sugar, Tiger, yum. Bookmark the permalink. ← Yes, You Want It But Do You Really Need It?